Bečovské rybníky - Bečov Ponds. A cascade of wood ponds with typical wetland and peat bog communities. Čistá - A peak elevation area of the Slavkov Forest characterised by its typical waterlogged biotopes. Dominova Skalka - Domino’s Rockery. A unique protected site with a large variety of rare and protected plant species. Grünská kyselka - Grün Acidulous Mineral Water. One of the best-known acidulous spring waters of the Slavkov Forest, also known as Novoveská kyselka. Homolka - Homolka Basalt Columns. A projecting neck with typical columnar erosion. Hora Krudum - Krudum Mountain. Krudum is said to have a green head, a heart of silver, and a foot of gold. Krásenské rašeliniště - Krásno Peat Bog. A gradually revitalized peat bog damaged by intensive surface mining. Lesný - The highest point of the Slavkov Forest. Medvědí rozhledy - Bear's Lookout. Almost unknown serpentinite rockeries hidden in forest coves, forming a not very extensive, yet distinct rock outcrop. Mokřady pod Vlčkem - Wetlands under Vlček. Protected wetland communities. Moučné pytle - Flour Sacks. Bizarre frost cliffs at Jelení Hill protected as a nature monument. Pastýřský buk - Shepherd's Beech. The most beautiful tree in the Slavkov Forest. Pluhův bor - Pluha's Pine Wood. A natural pine wood reserve with small-sized rockeries. Pramenské pastviny - Spring Pastures. A serpentinite rock cliff with rare wild flora. Raušenbašská lada - Protected Landscape Area. 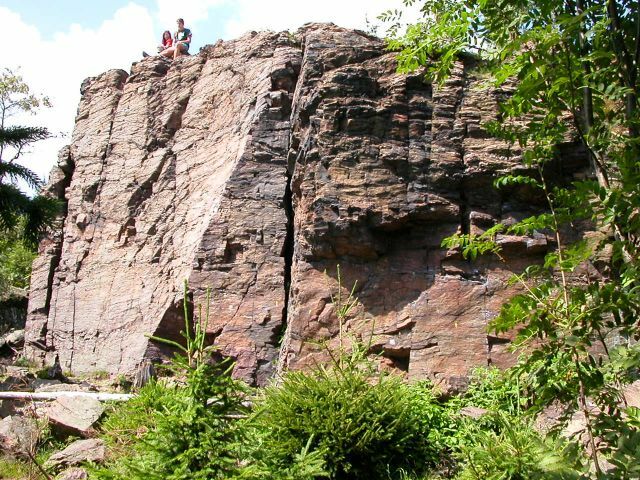 A natural large-scale serpentinite crest forming the central part of the largest serpentinite territory of its kind in the Czech Republic. It is known as Mnichovské hadce (Mnichov serpentinite). Sychravův smrk - Sychrava's Spruce. The mightiest spruce in the Karlovy Vary Region. Tři křížky - Three Crosses. A highly valued reserve that is home to protected plants growing on serpentinite parent rock unique in Europe. Údolí Teplé - Teplá Valley. A proposed nature monument of the canyon valley of the Teplá River and its tributaries. Upolínová Louka - Globeflower Meadow. A waterlogged meadow reserve with rare marsh flora – a true paradise for botanists. Vlček - A reserve with original pine stands. Hradiště - A military area since 1948, only its outer edges are currently accessible. It is one of the territories in central Europe least touched by civilization. It is the natural habitat of the kingfisher, big pearly butterfly, crayfish, wasp spider, black grouse, and many other wildlife species. Týniště - A shallow pond with surrounding dry pastures – the most significant locality of the fire-bellied toad. Božidarské rašeliniště - Boží Dar Peat Bog National Nature Reserve. It is the largest peat bog in the Ore Mountains. A nature trail closed since 2007 due to damaged plank paths leads through the nature reserve. Božidarský Špičák - Boží Dar Špičák Mountain. The highest volcano in Central Europe (1115 m). Dračí skála - Dragon's Rock. A granite jag at an elevation of 953 metres above sea level. Horská louka u Háje - A mountain meadow reserve near Klínovec. Halbemeiler Wiesen - A mountain meadow reserve near Milov located on German territory. Jelení vrch - Deer Hill. A park covering an area of 36 km2 located near the state border with Germany. It adjoins with the Přebuz Nature Park. Kamenný hřib - Stone Mushroom. A granite boulder near the village of Šindelová resembles a huge stone mushroom and it is a perfect example of granite rock erosion. It covers an area of 0.08 ha. Lišejník pod Tisovcem - A rare species of lichen, which appeared on the ore dumps near the town of Kraslice. Mrtvý rybník - Dead or Black Pond named according to its dark waters, it was founded in the 16th century. Přírodní park Přebuz - Přebuz Nature Park. An extensive complex of raised peat bogs, ponds, mountain meadows and forest ecosystems located in the vicinity of the village of Přebuz in the spring area of the Rolava River and its tributaries. Rašeliniště Oceán - Ocean Peat Bog Nature Reserve. A nature reserve since 1969 with peat bogs covered with dwarf mountain pine stands, wildlife species include the grouse. Rotavské varhany - Rotava Basalt Organs. A superb example of basalt columnar erosion in the former quarry near the town of Rotava. Rudné - Ore Mountain wetland meadows with an abundance of orchid species. Rýžovna - Rýžovna Nature Reserve. Established in 2001, the reserve protects mountain vegetation communities. Examples of columnar jointing, i.e. basalt organs, may be found in the local quarry. Skály na Strašidlech - Ghost Rocks. A fascinating group of monumental granite rocks near Horní Blatná. Smolné pece - Remains of mining activities in the village of Smolné pece. Black grouse - An endangered species inhabiting the hilltops and peaks of the Ore Mountains. Vlčí a Ledová jáma - Wolf Hollow and Ice Pit. Remains of historical underground tin ore mines near Potůčky covering an area of 0.24 ha. Worth visiting are two depression systems, remnants of the Jiří and Wolfgang mines. Vysoká Pec - Wetland meadows with rare plant species. Vysoký kámen - Tall Stone. A geomorphologically distinct group of quartz rocks near the town of Kraslice with remnants of natural talus stands with such wild flora species as perennial honesty, covering an area of 2.75 ha. Zlatý kopec - A park located along the state border with Germany approximately 5 km to the northwest of Boží Dar. Zlatý potok (Golden Stream) which flows through the village of Zlatý Kopec (Golden Hill) drains water from the top plateaus of the Ore Mountains to the north through a deep woody valley towards Saxony. Mechové údolí - Moss Valley. A nature reserve with a rare orchid species and a unique peat bog. Lipovka - A nature reserve near the village of Poustky near Dolní Žandov. Bystřina a Lužní potok - Site of Community Significance. Rare wild flora and fauna species inhabiting wetland alluvial plains along the streams are protected. Goethova skalka - Goethe's Rock. Bizarre quartz rocks near Hazlov, covering an area of 1.33 ha. Halštrov - Halštrov Forest Nature Park with an area of 43 km2, the source area of the Bílý Halštrov Creek. Kamenné vrchy - A park in the Aš headland situated along the German border (Saxony) between Vojtanov and Luby and covering an area of 36 km2. Naleziště U Cihelny - A deposit of egeran and vesuvianite in the vicinity of the Ovčín Pond. Smrčiny - Smrčiny Nature Park. A park covering an area of 72 km2, situated in the Aš headland along the German border (Bavaria and Saxony). Vernéřovské doly - Vernéřov Mines. An old mine waste dumpsite near Aš where the accompanying rock of the vein composed of mainly of quartz may be found; exceptional type of mineralization; area of 0.26 ha. Komorní hůrka - Chamber Mountain. Remains of our youngest Tertiary volcano. Linden in Kozly - A monumental small-leaved linden unknown to the public until 2003. Kyselecký hamr - Rich acidulous mineral water spring in the valley of Stebnice Stream. Pomezní rybník - Border-line Pond. Pomezní rybník Nature Reserve protecting the pond and surrounding wetlands near Pomezí. Rathsam - Rathsam Nature Reserve. An area protecting the natural confluence of the Ohře and Reslava rivers and the adjoining wetlands. SOOS NNR - A unique nature reserve with fens, peat bogs, and mofettes. Amerika Pond - A nature reserve protecting the island nesting area on the Amerika Pond. U Sedmi rybníků - At the Seven Ponds. A complex of protected ponds and wetlands with rare wild flora and fauna species. Wallenstein's Oak - A 450-year-old oak in Okrouhlá, which belongs among the most monumental trees in the region. Železná hůrka - Železná hůrka National Nature Monument. A well-preserved cone of a Quaternary volcano near the Mýtina border crossing. Hora Suk, Sopka - Suk Mountain. A Tertiary mountain of volcanic origin above the village of Hory. Hořečková louka - Gentian Meadow. A meadow near the village of Pila with abundant occurrence of Gentianella obtusifolia as well as other wild fauna and flora species. Křížové stromořadí - Alley of the Cross. A 100-year-old linden alley planted in the shape of a cross by Duke Beaufort of Bečov. Olšová vrata - Alder Door. A rockery partially overgrown with endangered plant species. Skalky skřítků - Gnome Rock National Nature Monument protecting a rock massif formed by dozens of pseudokarst hollows in volcanic rock. According to a legend, the rocks were the home of good gnomes. Svatošské skály - Jan Svatoš Cliffs National Nature Monument protecting a group of romantic granite rocks. Špičatý kámen - Pointed Rock. A picturesque granite rock near Loket with an iron cross at its top. Alej Svobody - Svoboda's Alley. A 2.5 km long alley with hundreds of 100-year-old protected trees. Holina - A nature reserve protecting original fir and beech stands near Kynžvart. Kladské rašeliny - Kladská Peat Bogs National Nature Reserve formed by several peat bogs. Koňský pramen Horse Spring. A system of mineral springs to the northwest of the village of Chotěnov. Král smrků - The King of Spruces. A unique monumental tree planted in 1815. Kynžvartský kámen - Kynžvart Rock. A granite block with perfectly weathering micro-shapes located not far from Lázně Kynžvart. Milhostovské mofety -Milhostov Mofettes. A nature monument in the valley of Elm Brook. Lazurová hora - Lazurová Mountain Nature Reserve. A romantic and mysterious mountain not far from Dolní Kramolín. Ovesné Kladruby - A flat stream mead with spontaneously developing peat vegetation. Planý vrch - Planý Hill. A natural pine stand on serpetinite sub-grade rock. Podhorní vrch - Podhorní Hill Nature Reserve and the highest peak of the Teplá Highlands with a lookout point. Pramen Čiperka - Čiperka Spring Nature Monument. One of the most famous acidulous mineral waters of the Slavkov Forest springing out a kilometre to the north of the town of Michalova Hora. Prameniště Teplé - Teplá Spring Area. A nature reserve protecting waterlogged meadows with rare plant species. Rezervace Smraďoch - Smraďoch (“Stinky”) Nature Reserve. 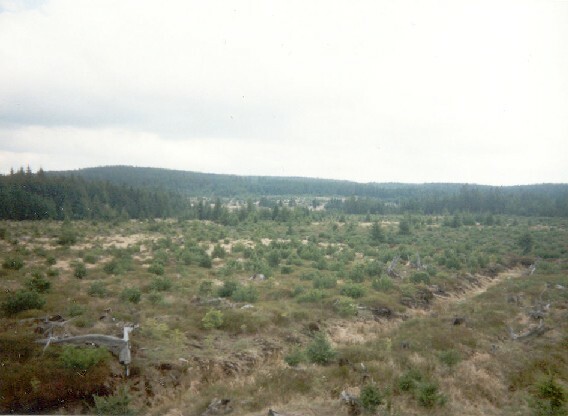 A raised forest bog situated in an area of concentrated mineral water effluents and gas emanations (carbon dioxide and hydrogen sulphide) in the form of mud volcanoes, i.e. mofettes. Sirňák -One of the last relics of the once powerful volcanic activity: sulphur-carbonic emanations that create typical mud craters. Kynžvart Castle Park - A remarkable park with many aged solitary trees. Čedičová žíla Boč - Boč Basalt Lode . A perfect example of columnar structure near the village of Boč. Borecké rybníky - Borek Ponds. A complex of ponds that has become a true paradise for amphibians and birds. Ostrovské rybníky - Ostrov Ponds. A complex of ponds and wetlands with a large variety of bird species. Popov Trees - Popov Trees. Several protected trees may be found in the former village of Popov. Stráž nad Ohří Nature Park – A nature park with an area of 37 km2 situated in the north-western part of the Doupov Mountains on both sides of the Ohře, which squeezed its way through the massif of the Doupov and Ore Mountains. Údolí hadů - Snake Valley. A locality by the Ohře where all species of snakes native to the Czech Republic may be found, including the rare Aesculapian snake (Zamenis longissimus). Jeskyně u Svatavy - Svatava Caves. Several caves in sandstone bedrock located at the foot of Svatava Hill. Leopoldovy hamry - Leopold's Iron Mills. A nature park near the village of Krajková. Lomnické pinky - Lomnice Mining Pools. A rare and unique area of divergent biotopes which is a sanctuary, a feeding and nesting place for many bird species, as well as an important resting place and intersection for droves migrating across Europe. Nadlesí - Extensive forest stands formed by waterlogged spruce forest, random peat spruce forests and peat pine forests. Matyáš - The territory had once been a brown coal mine spoil dump. Today, it is a locality with ponds surrounded by woods and the home of several amphibian species, e.g. the great crested newt. Monumental Poplar Tree - A 100-year-old Canadian poplar standing near the Town Council in the centre of the town of Sokolov, protected since 1984. Pískovna Erika - Erika Sandpit. The old sandpit is the natural habitat of rare animal species, particularly the natterjack toad (Epidalea calamita). Rezervace Studenec - Studenec Reserve. A natural peat bog where the rare bog arum may be found. Tůně u Vřesové - Vřesová Pools. The habitat of a number of endangered amphibian species near the Vřesová power plant. Údolí Ohře - Ohře Valley Nature Monument with pseudo-karsts formations. A palaeontological Tertiary flora locality. Loket Ivy - Two monumental protected ivy plants – one of the few protected ivy plants in the Czech Republic. Blažejovský rybník - Blažejov Pond. A rare biotope offering ideal conditions for many rare wild flora and fauna species. Čedičové varhany u Hlinek - Basalt Organs near Hlinky. A nature monument protecting an uncovered basalt fault in the former quarry. Javorná - A vast locality intersecting the southernmost border of the PLA, almost completely comprising of meadow and wetland biotopes. Odolenovice - Predominant wet meadows of the Odolenovický Stream head water basin. Přírodní památka Valeč/Valeč Nature Monument. A vast deposit of various minerals and the deposit of hyalite of world significance, covering an area of 576.74 hectares. Skalka pod Tisovským vrchem - Skalka below Tisový Hill is one of the remotest outcrops of Mnichov serpentinites. Střela - The meandering Střela river, which is home to the rare brook lamprey. Dominik Boulder - A bizarre perched boulder near the village of Javorná. Vladař - Vladař Mountain. A basalt table mountain with thermophilic mixed stands and abundant scrub near Zábořice. Velký údrčský rybník - Big Údrč Pond. An important pond complex with a combination of wet and dry flower meadows.